“It’s just like the Oscars,” was the oft-repeated phrase that was heard by those networking their way through the throngs attending the first-ever Agents’ Choice Gala at Toronto’s Eglinton Grand last week. 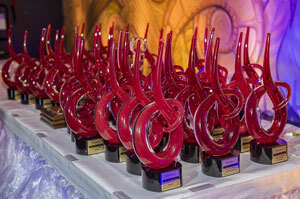 It was a night when the stars of the Canadian travel industry shone brightly, as Baxter Media – along with presenting sponsors, Air Canada and Sandals Resorts International; feature sponsors, WestJet, TravelBrands and the Jamaica Tourist Board – welcomed a sold-out crowd for the first annual Agents’ Choice Gala. 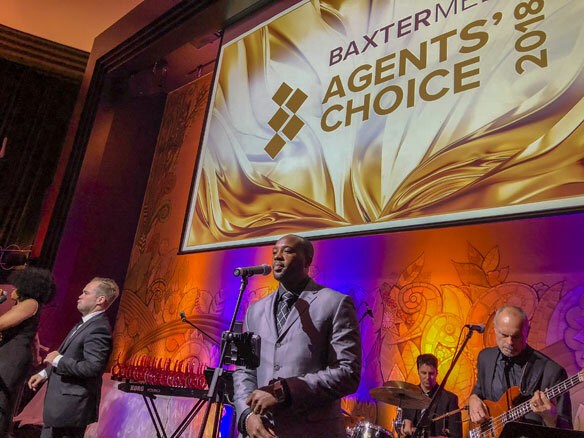 In all, 350 agents and suppliers celebrated the presentation of the 2018 Agents’ Choice awards to the Favourite suppliers in 43 categories – ranging from airlines to cruise lines; tour operators to destinations; car rentals to airports – and the list goes on and on. There was also Hollywood-like excitement, as the superbly talented Nova Sounds Band led by Dr. Alan Shiner and including double JUNO Award winner Sonia Collymore, entertained the VIP industry crowd throughout the evening, as they enjoyed a dinner that featured Mediterranean salad; a main course of filet mignon and shrimp-stuffed sole; and lemon meringue tart for dessert. The evening began with a welcome from Baxter Media’s executive vice-president, Wendy McClung, and executive editor, Bob Mowat. The 2018 W.H. Baxter Lifetime Achievement Award was presented to Goway’s founder and president, Bruce Hodge, during the Agents’ Choice Gala last week. Seen in the photo, from l to r, are Baxter Media’s David McClung; Hodge with his award; and Rod Hurd, long-time friend of Hodge and a pioneer in student travel with TravelCUTS. One of many special surprises during the evening was the presentation of the W.H. 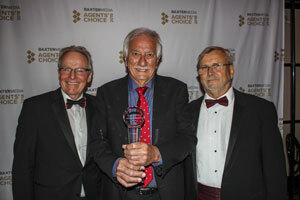 Baxter Lifetime Achievement Award to the founder and president of Goway Travel, Bruce Hodge. In fact, it was not the only award for Hodge, as the company he founded was also picked by agents as their Favourite Tour Operator to Africa and to Asia Pacific.